On The Day After, Democratic Dominance On Display. As always, winners and losers came together in the same room just hours after the primary for the biennial Unity Breakfast. Civil Beat. Democrats reflect, press on at Unity Breakfast. After months of battling on the campaign trail, Hawaii democrats gathered Sunday morning to break bread and move forward at the party's traditional Unity Breakfast. KHON2. After a fierce battle in the primaries, Hawaii's Democratic party candidates woke up early Sunday to come together in unity. KITV. Democrats, Republicans unite to strengthen parties into general election. Hawaii News Now. 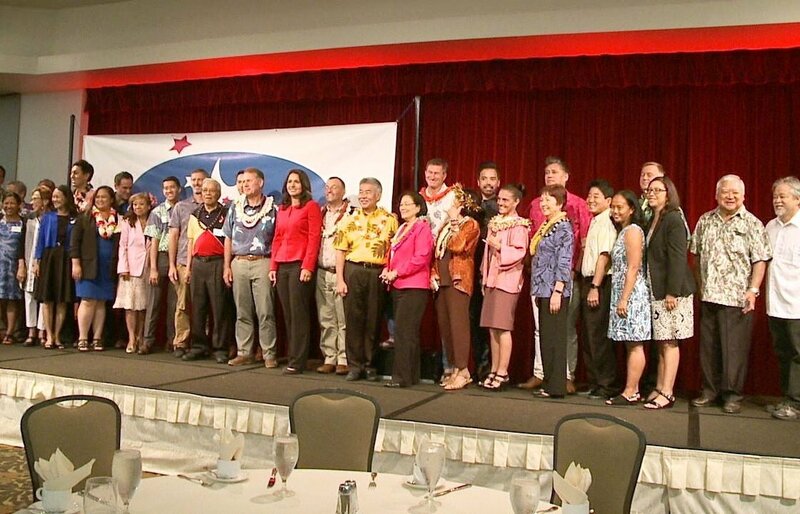 Hawaii Republicans gather with high hopes for the general election. KHON2. Gov. David Ige swept two-thirds of the House districts across the state on his way to a win over U.S. Rep. Colleen Hanabusa in the Democratic primary election Saturday, with Hanabusa claiming half of the neighbor islands and a sizable portion of Leeward Oahu. Star-Advertiser. Inside Ige’s Political Turnaround — And How Hanabusa Helped Him. Two natural disasters and an opponent whose overconfident campaign tried to run out the clock helped the governor secure a second term. Civil Beat. Political analyst recaps election night surprises. Some landslide victories in Saturday's primary election - and some surprises, too. KITV. What Happens to All Those Campaign Signs? Hawaii Public Radio. Hickam C-17 crews participated in historic N. Korea mission. The three Hawaii-based C-17s flew west days apart and landed at Osan Air Base in South Korea for what would be the rarest of missions. Star-Advertiser. Last year was the best year in a decade for Hawaii flower and landscape plant farmers, according to a recent report. Star-Advertiser. Surprise upsets in Honolulu City Council race. In the Honolulu City Council, Trevor Ozawa came out on top for District Four, Carol Fukanaga was the winner in District Six and Heidi Tsuneyoshi took the most votes in District Two, which covers Mililani all the way to Kahaluu. KITV. State Senator Brickwood Galuteria loses seat in primary election. He represents District 12 which includes Waikiki, McCully and Kakaako. KHON2. New prosperity envisioned for downtown’s Wo Fat building. What is described as the “most iconic building” in Honolulu’s historic Chinatown district is slated for restoration and return to restaurant use under a plan that also envisions a boutique hotel on the property. Star-Advertiser. Bad blood in Puna: Ousted councilwoman cries foul. When the dust settled on the Hawaii County Council District 4 primary election race, the final returns showed a political newcomer winning a 20-point landslide as a result of what she called an “aloha-driven, clean, positive campaign” and the ousted incumbent saying it “was anything but that.” Tribune-Herald. Hawaii County Council District 7 race headed for runoff in November. Hawaii’s primary elections were over as of today, but the race for Hawaii County Council District 7 is far from the finish line. West Hawaii Today. Commentary: Political snits snarl recovery from Big Isle eruption disaster. House Speaker Scott Saiki and Finance Chairwoman Sylvia Luke are out of line in their political bullying of Big Island officials trying to recover from an ongoing volcanic disaster that has crippled a major quadrant of the island. Star-Advertiser. The Harry and Jeanette Weinberg Foundation donated $300,000 to the Hawaii Community Foundation’s Hawaii Island Volcano Recovery Fund. Pacific Business News. A six-bedroom estate in Kukio Golf and Beach Club recently sold for $18.5 million, the second sale in the exclusive resort community on the Big Island of Hawaii to sell for more than $15 million this year. Pacific Business News. Baker’s win came by mail. But home districts also provided strongholds for this rematch from 2014. Maui News. Home district voters key for Victorino and Cochran. Both candidates want to counter the stereotypes and reach more voters. Maui News. Voters snub Arakawa in primary election for Kahului council seat. With all but one precinct reporting, mayor trails, but assured place in general election. Maui News. A controversial new seawall in West Maui is starting to take shape. The project is moving forward after a judge denied an injunction to block construction late last month. Hawaii News Now. Congratulations and a shared desire for the well-being of Kauai were on tap at the Democratic Unity Breakfast, held at the Kauai Veterans Center on Sunday afternoon, as about 70 candidates and supporters gathered to celebrate the successes of the party. Garden Island. There May Be No Stopping Derek Kawakami’s Mayoral Campaign. Meanwhile, a political newcomer emerges in the County Council race on a day when some of the island’s few voters were inspiring. Civil Beat. Sunday morning the fifth and final printout for Hawaii’s primary 2018 primary elections was released, solidifying who is moving on to campaign for November’s general election. Garden Island. Families that harvest salt from salt beds in Kauai fear current conditions in the unincorporated community of Hanapepe and climate change are threatening their important cultural practice. Associated Press. Air Charter Service Offered at Four Seasons Resort Lanai. Tourism executives say guests of the resort can now bypass airport waits and enjoy private daily air charter service from Honolulu’s Daniel K Inouye International Airport to Lanai City on one of two Pilatus PC-12 Lanai Air two-pilot aircraft operated by Mokulele Airlines. Maui Now.